"More people is more fun. Estimate one square metre per person for a cocktail party, or half a square metre per person for a party party," says John Wilson at Sydney boutique caterers Cook and Waiter. "You get a real buzz from being up close and personal, and it stops people being caught talking to the same group all night." "Get people to a merry plateau as soon as possible," suggests Christopher Thomas at Trolley'd, a hire-able mobile bar service that uses old Ansett trolleys. Whether it's a glass of champagne or sparkling, or something virgin, getting glass in hand immediately is a priority. Rodney Setter, sommelier at Sydney restaurant Sepia, suggests: "Go for a spritz. Pour a dash of Aperol in any type of glass and top up with Prosecco." "There's a real resurgence of homemade sodas. Pink lemonade syrup, made from blending raspberries, whole lemons (including skin!) and caster sugar, then strained, can be topped up with soda in an ice-filled glass as a refreshing, non-boozy welcome. 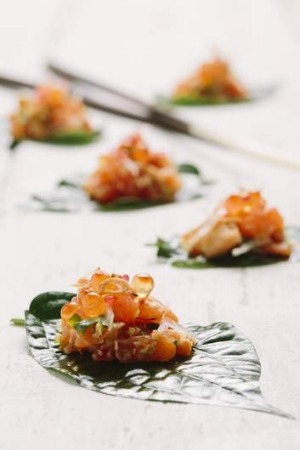 Add a dash of sparkling wine for a non-virgin version," suggests Miccal Cummins, director of Sydney caterers Gastronomy. In the hours before they arrive, guests have been dealing with babysitters, hair dryers, ironing and frustrating GPS instructions. When they arrive, give them something to eat straight away. It needs to be something pop-in-the-mouth, says Wilson at Cook and Waiter. See our recipes for delicious one-bite trout canapés. There is nothing sadder than a host so busy muddling and shaking drinks that she misses her own party. Shaking cocktails on the night is over the top. Punch, however, works. Thomas at Trolley'd explains: "The thing about a punch is that you get everything done before they turn up. It's chilled and you can relax and have a drink. It's all about mise en place with parties, so you're not chasing your tail instead of enjoying the party." See recipe. Make a trip to local vintage markets and shops like St Vincent de Paul in the search for old glasses of different styles. There's nothing wrong with having an eclectic table filled with well-washed and polished non-matching glasses. Mixed patterns will help guests remember which one is theirs. 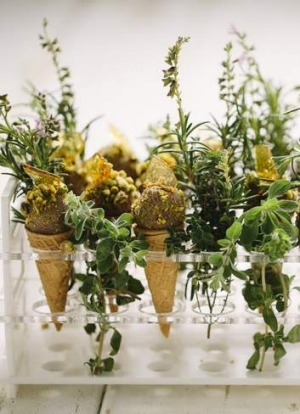 A quacking good dish... Chicken liver parfait cones. Delegate. Whether it's getting your other half to do their famous potato salad to go with your glazed ham, or hiring paid-for experts to do the heavy (service) lifting, parties are merrier for everyone if you're prepared to divvy up the work. And if your best mate offers to bring something, accept. But be specific and tell him exactly what you want, so his wretched cheese-squares-on-crackers don't ruin your vibe. "Make the ordinary extraordinary," says Kate Stewart at Melbourne-based Bright Young Things Culinary Event Makers. "Days or weeks before decide on a colour or theme. Paint a trestle that will act as your drinks table. Personalise items by using stamps, handwritten menus, wrapping ribbons around jars or try paint dipping wooden and ceramic items such as spoons and pot plants. Spray paint fruits in gold or neon, dip jars in colourful paint and fill them with flowers." It may seem indulgent, but hiring items such as glasses, cutlery, linen and even a six-litre drink dispenser for punch is less expensive than you might think. Imagine, no washing up! Or go all out with a pressed metal bar or food station for the garden from which to serve drinks. For an elaborate affair, get a wire pergola in and decorate it with fresh flowers and balloons with silver tassel garlands. Give friends the party equivalent of air-brushing; dim the lights. Break out non-scented candles and use fairy lights outside. Richard Breatnach, the managing director of Sydney-based Workshop Events, says scented candles can work if it adds to the theme. Coconut candles work for a Hawaiian party, for example. But otherwise they shouldn't be seen outside the bathroom. "Use lighting to highlight a feature in the house, it looks sensational. Use what's already there. If you're in the garden, highlight the trees or the plants. You have a natural backdrop there." Branches can add sculpture to a table. Go into the garden with pruning scissors and bring anything budding or flowering in. Trim away shaggy leaves, stick the branches in a vase or lay across the centre of a table. "There's nothing worse than hosts or guests coming in and changing the song 10 seconds into a track. Have the music dealt with before guests arrive. Consider the audience and the tone of the party. Use Spotify and create a few playlists, then hit play when you're ready," says Richard Breatnach, Workshop Events. The Preatures' recent EP (Is this how you feel? ), Bombay Bicycle Club, The Jungle Giants, San Cisco and a few Doobie Brothers tracks (such as Listen to the Music) will kick the party off. We love a burst of fresh flavour with our canapes, single mouthfuls served in little wooden or Chinese spoons. Do the pink grapefruit, prawn and coconut mixture ahead and add to the little spoons each time a new tray needs filling. Unchain yourself from the service tray. Set up a DIY canape station instead. Cummins at Gastronomy explains: "Set up a table featuring two-bite-sized buns, 10 condiments such as homemade bearnaise and pesto, onion marmalade, mustards, a finely chopped fennel and citrus salsa, and let guests make their own canapes. Roast a fillet of beef and serve it cold and sliced, and have seared rare tuna, thinly sliced, or do a glazed baked ham. 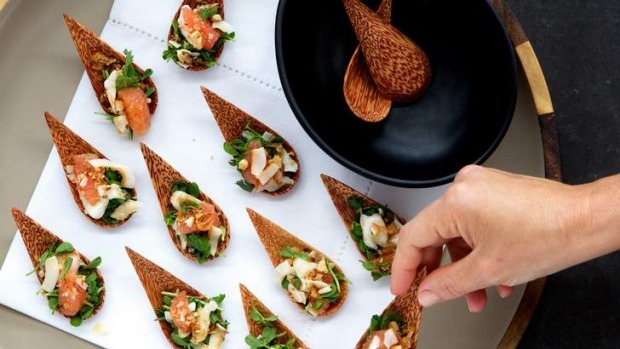 DIY canapes say generosity and fun." That gilded mirror you have hanging on the guest bedroom wall can work as a canape platter. Literally serve little finger sandwiches on the glass (give it a good spray and polish). The frame makes an excellent talking piece and the mirror base makes the food look abundant. Give tradition a twist and make sure party favourites are served as manageable canapes that don't leave guests with a stick to hold (or hide in their pockets). Stewart at Bright Young Things suggests: "Duck parfait cones with Seville marmalade, pistachio powder and praline are always a party hit. It's right on trend. They look like sweet ice-cream cones, but with a twist." Asking guests to remember which wine they had in their glass is a nightmare! Serve one red and one white, it saves on glasses and bother. Rodney Setter, sommelier at Sepia, suggests a light white, something easy to drink like a medium dry, Mosel Kabinett riesling. It's fruity and food friendly. In terms of red, go for something light that you can chill. You don't want to be drinking 15 per cent shiraz in the middle of summer. Setter suggests a Beaujolais or a light pinot noir. It seems like an extravagant answer to lazy hosting, but hiring a waiter or two for a party can lift it a few notches. It saves the host from running around all night. Wilson at Cook and Waiter suggests one waiter for every 15 people for a stand-up party. "They clean up as the night goes on, and afterwards. You want to be part of the party, not dealing with abandoned glasses." Thankfully for the time-poor, there are people who specialise in bringing wow-factor direct to your door. Throw many parties? We'd love to hear your tips. Login the to the comments and share your secret to a perfect party. The comment on this story judged to be the best by the goodfood.com.au editor will be published in The Feed in the Epicure and/or Good Food print sections next Tuesday and win $100 in prepaid cards courtesy of eftpos. Comments will close on this story at 5pm AEDT Thursday November 14.